The Identities of the Chips Gordon Moore used to Intuit His Eponymous Law, Revealed! Five transistors, six transistors, seven transistors, Moore. Not a particularly monumental article title, is it? “The complexity for minimum component costs has increased at a rate of roughly a factor of two per year… Certainly over the short term this rate can be expected to continue, if not to increase. Over the longer term, the rate of increase is a bit more uncertain, although there is no reason to believe it will not remain nearly constant for at least 10 years. That means by 1975, the number of components per integrated circuit for minimum cost will be 65,000. Although Moore’s Law – as it applies to planar, monolithic device scaling – has definitely run the last mile of its marathon, it had a profound economic effect on the semiconductor industry in particular, the electronics industry in general, and the world’s overall economy as well. That was no small feat for a 4-page article that appeared in a relatively obscure trade journal (as far as the public was concerned at the time) covering a relatively small (for the time) industry. Over the past 50 years, many books and many, many magazine articles have discussed, analyzed, and reviewed Moore’s Law. I’ve written at least a dozen such articles myself. (Many of these articles erroneously credit Moore’s Law with semiconductor advances that rightfully belong to Dennard scaling: faster transistor speed and lower power consumption with each new process node.) At this point, you’d think there’d be nothing left to discuss regarding that original article on Moore’s Law. It’s been standing proud in the above graph for nearly 54 years. Do you see it? I didn’t. Not for years. Not until an article written by David Laws highlighted my own blindness. For the past dozen years, Laws has been the Semiconductor Curator at the Computer History Museum in Mountain View, California. He’s also served as president or vice president at three semiconductor companies (Quicklogic, Altera, and AMD), so he’s got semiconductors in his blood. (Figuratively, not literally.) During the 1960s, Laws worked for SGS-Fairchild in the UK and then moved to Silicon Valley in 1968. So, Fairchild Semiconductor’s history is of particular interest to him, and he’s written many articles about that history. Laws’s latest article, published on the Computer History Museum’s Web site, is titled “Madeleine Moment Connects Moore’s Law Artifacts.” This new article describes an artifact acquired by the museum in 2017. It is just a sheet of memo paper bearing Gordon Moore’s imprint with seven crudely drawn rectangles and some writing. There’s a small rip in the sheet of paper that’s been repaired with a yellowing piece of cello tape. This small artifact was donated by Sheila Sello after her husband Harry Sello passed away in 2017. 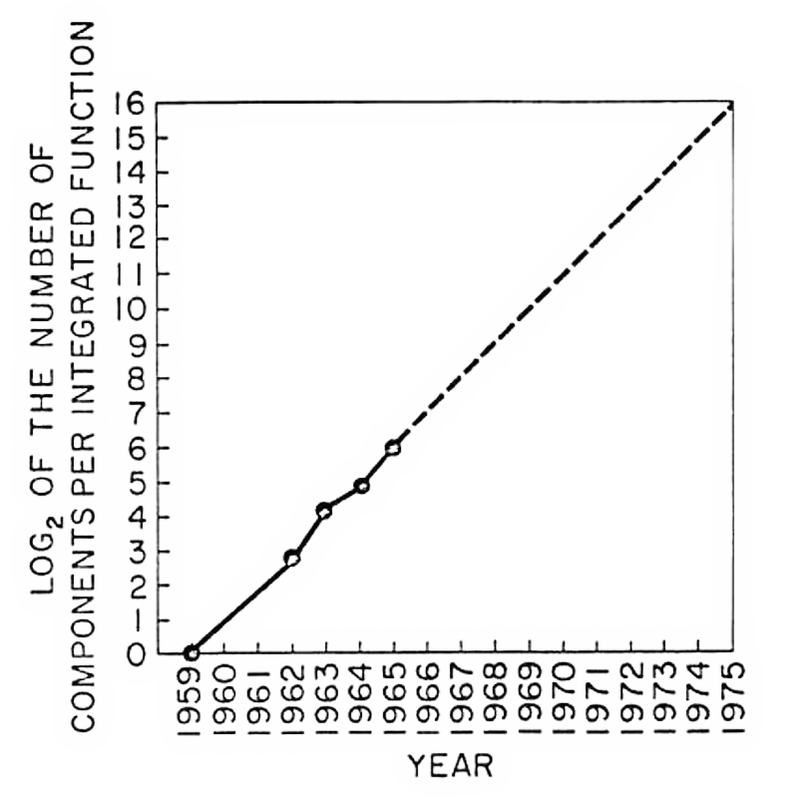 That’s the criterion Gordon Moore used to select the devices that he represented on the graph in his 1965 article. Moore’s Law is about semiconductor device density and cost. Two years later, Sello collected the requested semiconductor die and shot a group photo. That photo appears in Laws’s article and below, reproduced here with permission from the Computer History Museum. Ten years ago, while Sello worked as a Computer History Museum docent, Laws asked him about his photo. It had become part of the museum’s collection, and Laws was researching the history of Moore’s Law for the museum’s Silicon Engine online exhibit. At the time, Sello could recall the identities of a couple of the chips in his photo, but he could not remember all of their names nor their dates of manufacture. In my opinion, Moore’s graph is likely the most important graph ever plotted in the history of semiconductors, and the devices used for its five data points are completely anonymous. After reading Laws’ article, I suddenly became extremely curious about the devices that provided the five data points Moore used to plot this graph. 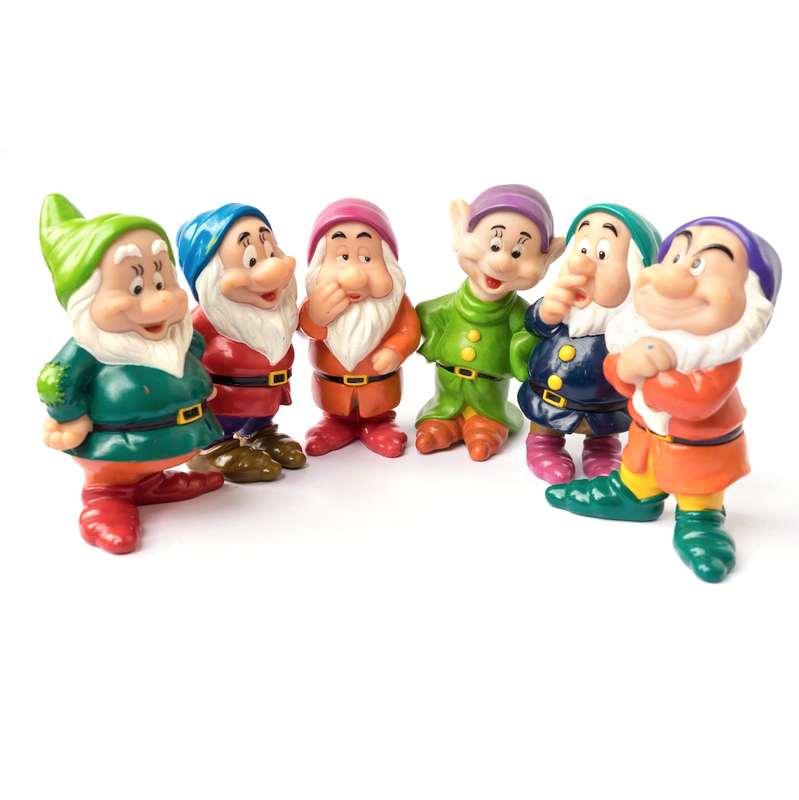 They’ve remained nameless for more than half a century. Device #1: Fairchild 2N697 NPN, 150mA, 60V, bipolar transistor, 1 component, circa 1959. Fairchild Semiconductor’s first commercial semiconductor products were the 2N696 and 2N697 silicon transistors. The two transistors were identical parts, sorted and binned by testing for current gain. 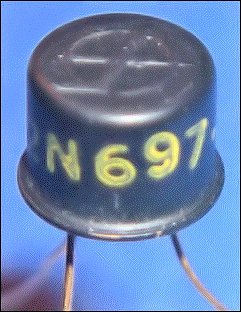 (The 2N697 has double the current gain compared to the 2N696, so the best transistors were stamped “2N697” and the rest got the “2N696” stamp.) The two transistors were the first commercially available semiconductor devices to be made with the mesa process, using photolithography and double-diffused junctions developed by physicists, chemists, and engineers instead of grown alloy junctions made with heat, small drops of liquid antimony or indium, and a big dollop of alchemy. Fairchild shipped prototypes of the 2N697 transistor to IBM’s FSD (Federal Systems Division) in 1958. They were destined to be used as magnetic-core memory drivers in the on-board computer that IBM FSD was designing for North American Aviation’s ill-fated XB-70 Valkyrie bomber. However, the transistors themselves were not ill-fated. Far from it. Fairchild commercialized the 2N696 and 2N697, and the first ad for these transistors ran in August, 1958. The prototypes reportedly cost IBM $150 a pop. A legion of semiconductor manufacturers quickly copied these devices. You can still buy 2N696 and 2N697 transistors, by the way. However, they no longer cost $150 each; they’re not made with the mesa process any longer; and you won’t be buying them from Fairchild. The 2N697 is the only pre-IC semiconductor device on Moore’s graph. 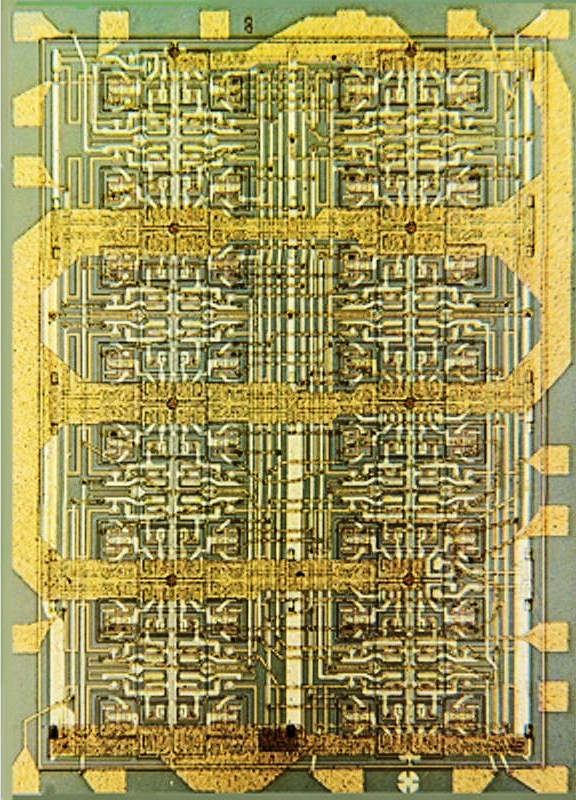 Fairchild Semiconductor built the first integrated circuit in 1959 by extending the photolithographic concepts used to fabricate the 2N696 and 2N697 transistors. The improved process became known as the planar process. Fairchild’s planar process is still the bedrock foundation of the entire semiconductor industry. Device #2: Fairchild μLogic Type G RTL IC, 7 components, circa 1962. 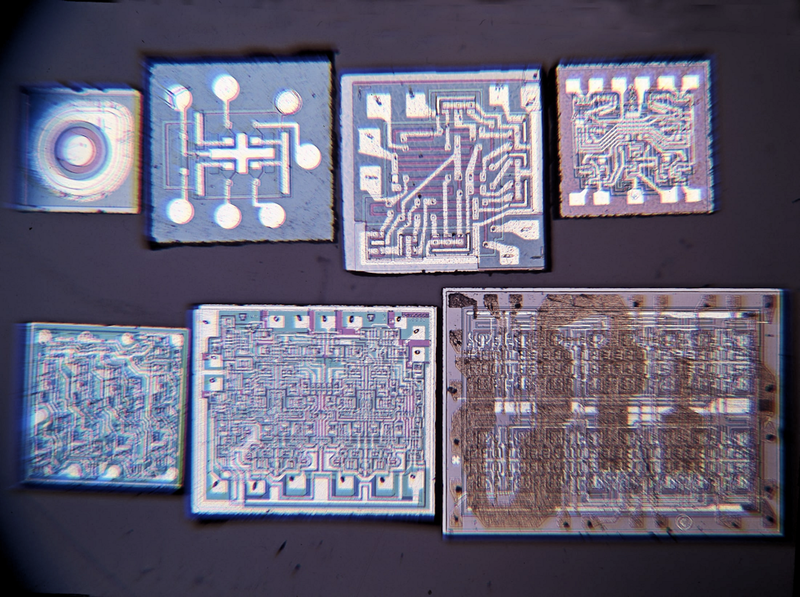 These six IC elements form the first IC logic family, Fairchild’s initial RTL (resistor-transistor logic) series. (Note that “RTL” does not mean “register-transfer level” in this context. That’s a more recent overloading of the term.) These RTL parts were later renamed Fairchild’s μLogic 900 and then 9900 series. However, weight and size of the electronics package were both very critical parameters for one specific space program, code named “Apollo.” NASA tasked MIT’s Instrumentation Lab with developing the AGC (Apollo Guidance Computer) to navigate and land astronauts on the moon and to return them safely. The Instrumentation Lab realized that the AGC’s size and weight would be extremely limited, which meant that the computer’s designers needed to develop the AGC using revolutionary, lightweight, miniaturized electronics technology. On February 27, 1962, MIT’s Instrumentation Lab ordered 100 Fairchild μLogic Type G ICs at the price of $43.50 each (in 1962 dollars!) for evaluation. Within a few months, the MIT Instrumentation Lab concluded that, yes, ICs were a very good thing to use for the Apollo Guidance Computer and used 4100 of them to implement all of the logic in the AGC’s Block I design. By 1965, the AGC program had purchased some 200,000 Type G logic chips at an average price of $20 to $30 each. Game on! Device #3: Fairchild μLogic Type R, D-type RTL Flip-Flop, 33 components, circa 1963 or late 1962. I guess that’s all you or I really need to know? Actually, with a little help from David Laws and some additional research, it’s clear that the Type S Half-Shift Register contains the logic needed to serve as either the master or slave latch in a master-slave RS flip flop. A master-slave flip-flop also needs an inverter or an inverting gate to invert the clock to the slave latch, so it appears that you’d need three RTL ICs to build a master-slave RS flip-flop: two Type S Half-Shift Registers and one inverting buffer (or a discrete transistor). This explanation conveniently leads to the next device in Sello’s photo. Device #4: Fairchild DTL 945 Master-Slave Clocked RS Flip-Flop, 34 components, circa 1964. The first two ICs on Moore’s graph (devices #2 and #3) were RTL chips. The fourth device is a DTL (diode-transistor logic) clocked RS flip-flop with all of the logic needed to implement a master-slave device. The Fairchild 945 (later, the 9945) clocked flip-flop was part of the company’s 930 DTL logic family (later renamed the 9930 series). The first-generation RTL ICs were quite successful, but they quickly became outdated because they were too slow and drew too much power. (Nothing’s changed in 50 years, has it?) Clearly, RTL ICs would be supplanted quickly and DTL was the first logic family to try for the brass ring. Signetics, founded in 1961 by a renegade group of Fairchild engineers who wanted to focus exclusively on ICs when Fairchild’s management wouldn’t let them do it (sounding familiar? ), developed the SE100 DTL logic family as its first standard product line. Announced in 1962, the SE100 DTL logic family bit into Fairchild’s RTL market. The machine that was Fairchild countered with the 930 DTL logic family, which offered better performance specs and lower prices than Signetics’ DTL parts thanks to Fairchild’s superior lithographic and process technologies. The result was predictable. Fairchild’s 930 DTL logic family bit back and dominated the logic market for years, until the TTL wars erupted. The 930 DTL logic family became a huge commercial success. Fairchild succeeded in dominating both the first and second IC logic generations with its RTL and DTL logic families. Device #5: Fairchild CμL 958 Decade Counter, 58 components, circa 1965 or late 1964. Now we’re getting into some serious integration. Fairchild’s 958 (subsequently renamed the 9958) Decade Counter appeared during the heyday of Nixie displays. Everyone in the instrumentation business during the 1960s coveted the warm, orange, digital glow of Nixie-tube readouts for their counters, timers, and digital voltmeters. If you wanted your equipment to look modern in the 1960s, you just needed to sprinkle a little Nixie dust. Device #6: Fairchild 9300 4-Bit Universal Shift Register, 125 components, circa 1966. There was a ferocious race to develop new logic families capable of becoming the industry’s top TTL dog. Fairchild developed the 9300 series (10x better than the 930 DTL family, perhaps? ), which included the 9300 4-bit universal shift register IC. Why is it universal? It has an asynchronous reset input pin. It has a parallel load feature using four parallel input pins. The register’s four output bits are likewise available on output pins. It shifts left or right, if you wire it correctly, to exploit the parallel-load feature. It slices; it dices; and it juliennes. Alas, by 1967, Texas Instruments’ year-old, low-cost, plastic-packaged 7400 TTL family was burying Fairchild’s 9300 TTL family and, adding insult to injury, TI produced pin-for-pin replicants of Fairchild’s best 9300-series designs and slapped 7400-series part numbers on them. Want proof? If you know your 7400-series TTL Data Book, you may recognize the 9300 4-bit Universal Shift Register as TI’s 74195 4-Bit Parallel-Access Shift Register. Similarly, Fairchild’s 9341 ALU became far more widely known as TI’s 74181 ALU. Device #7: Fairchild Micromatrix 4500 DTL, Mask-Programmable, 32-Gate, Gate Array, 264 components, circa 1967. Truly, I’ve saved the best device for last. The Fairchild Micromatrix 4500 was the industry’s first commercially successful, mask-programmable gate array – introduced all the way back in 1967! (The Star Trek episode “City on the Edge of Forever” that I obliquely referenced in the first paragraph of this article originally aired in 1967.) The Micromatrix 4500 Gate Array – it’s really the world’s first commercially successful ASIC – incorporated a whopping 32 uncommmitted 4-input AND/NAND gates (the output inverter could be omitted using appropriate mask wiring) that you’d connect up using two metal mask layers. Fairchild introduced early EDA software including the FAIRSIM logic simulator and automatic placement and routing programs to help designers lay out the metal interconnect for the Micromatrix 4500 Gate Array. Several Fairchild customers developed custom ASIC designs based on the device. In addition, Fairchild tried developing a few standard devices for its own product catalog using the 4500 Gate Array as a master slice. David Laws sent me a photograph of the Micromatrix 4500 Gate Array die. It appears below. Laws estimates that the Fairchild Micromatrix 4500 Gate Array incorporated 264 components, based on his visual assessment of the above die photo. Today’s behemoth chips fabricated with nanometer lithography incorporate several tens of billions of transistors plus many more assorted electronic components. We’ve needed only fifty years to go from two hundred components on one semiconductor die to tens of billions. By any yardstick that you might care to use, that’s a stunning achievement, and Gordon Moore predicted all of it in 1965 with the merest whiff of data – just five data points – and a massive intuitive leap. Moving the goal post from one year to two years to make the graph fit is typical forecasting. And he was just postulating a growth of complexity – to later come back and call it a ‘law’ seems like an interesting PR coup. When did the term Moore’s Law first appear? Who used it? My guess is some Intel pronouncement. Intel did not even exist when Moore wrote his article. He was working for the company he founded previously, Fairchild. Also, he didn’t call it Moore’s Law. Caltech professor Carver Mead popularized the term “Moore’s law” in 1975, ten years after the article appeared. Mead was another luminary in the semiconductor field. To add to what Steve said, the change from one year to two also didn’t happen until ten years after the article. And, in the article itself Moore said the trend could be expected to continue for at least ten years, so the change was actually more of a follow-on prediction after the first ten year forecast had proven true. On die cooling by reverse biasing an IR led so that it absorbs IR photons rather than emitting them. There are several obvious ways to make this really effective toward extending Moore’s Law. 2) layer these nano coolers in 3D to cool active circuits both above and below the nano cooler, enabling 3D IC construction that was previously limited because we couldn’t get the heat out of the middle structures, and would generate high on die thermal gradients … and thermal noise. No longer talking about a single layer of FinFET’s … but possibly dozens where lower power layers of static RAM are sandwiched with nano coolers and high frequency logic. 3) use heavy … very heavy metal layers for both heat spreaders and stable voltage planes in the nano cooller and active logic layers.